Akai, working in collaboration with Retronyms, has released the second version of its iMPC Pro iPad app - the appropriately-named iMPC Pro 2. Notably, this now offers audio track recording and support for Audio Units, making the app feel more like a proper mobile DAW than ever. You can manipulate your audio using the pitchshifting, timestretching and other editing features. There’s also a new library of built-in sounds – kits that cover a range of contemporary genres. You can download five additional custom sound packs for free. iMPC Pro 2 represents the next stage of evolution for the iMPC series,” said JP Walton, Co-founder of Retronyms. “It takes the classic beatmaking workflow found on the original and adds something we've been working on for a long time - the ability to rap or sing over the beat you’ve produced. This evolves the mobile beatmaking app concept into a more complete song creation tool. It has synchrony with what Akai has been working on with MPC desktop and their hardware as well." 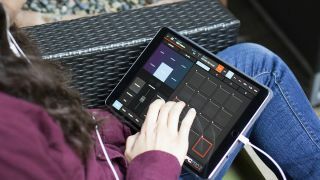 iMPC Pro 2 costs $24.99 and is available now on the Apple App Store. Existing users can upgrade for $10.